The eighties gave birth to dreary music performed by exhibitionists with funny clothes and even funnier hair styles. Almost all the musicians had a serious approach and found it hard to have fun. Roman Holliday changed all this. 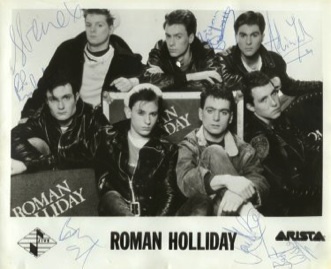 Brian Bonhomme started Roman Holliday in November 1980 with just 4 members (Brian, Steve Lambert, Simon Cohen and Peter Noone). Peter later left the band. Other members soon joined. First there was Rob Lambert then Jon Durno, who Steve met in a pub. Next to join the band was John Eacott, who was found busking in Soho Square. Adrian York joined the band in December 1982, knowing John, he went along to the band knowing they needed a piano player. There was one other person in the band, Tony Wallman, but Tony left the band just before Roman Holliday hit the big time. The 7 member British band first appeared on the scene in 1983 releasing their first record. They had big baggy clothes, slip on trainers and wore sailor hats, which was a little strange. The shock everyone had was in their music. No dreary songs and techno instruments, but good toe-tapping rhythm and jazz style scores. When you heard one of their songs, it made you want to tap your feet and sing a long with the lyrics. The album that followed in the same year (Cookin' On The Roof) showed the range of vocals and instrumentals, from the fast tempo Stand By to the slower song Serious Situation. In the UK version of the album, the first 25,000 copies came with a giant poster of the band, with lyrics to the songs on the reverse. This poster graced my bedroom wall for many years and the album was almost wore out through playing it so much. The cassette version had the bonus tracks "Beat My Time" and "Round And Round" (See RECORDS for more details). In 1984 John Eacott and Rob Lambert left the band, leaving only 5 members. The group went on to release a follow up album (Fire Me Up) containing a track for the film Teachers. The song being One Foot Back In Your Door written by R.J .Lange. The 12" single of this song contains a re-recording of Don't Try To Stop It and Stand By. The difference is amazing. Gone are the horns and jazz sound created when Saxophonist Rob Lambert and Trumpeter John Eacott were in the band, and is now replaced by a smoother synthesizer version which is not quite so toe tapping as the original. The title track is my favourite song. Roman Holliday split up in the mid 80's, leaving behind them some very sad fans. Roman Holliday may be gone, but their music lives on and the fans are still as dedicated as before. The group reunited again in 2001 for a reunion gig at The Borderline in London. For all those who attended it was a great night of entertainment. Unfortunately, it looks like there will be no more gigs, even though they would like to, as Brian and Steve live in the USA, and the rest of the band live in England, making it a little difficult to progress further.